Hudepohl-Schoenling | Beer Apprentice - Craft Beer News, Reviews, Interviews and Info. For today’s craft beer review I’m going to be trying another Oktoberfest beer. I’m steadily working my way through all of the one’s I picked up on my last trip to the liquor store and I have only a few left, so today I’m going to be trying the Hudepohl Oktoberfest Bier produced by the Hudepohl-Schoenling Brewing Company located in Cincinnati, Ohio. I have never tried this Oktoberfest before, so I’m hoping that I have a nice experience. Let’s see if we can find any information about this beer on the website, hudepohlbeer.com. Nope, nothing there, so let’s look on ratebeer.com. Hudepohl Oktoberfest Bier made from only pure quality ingredients, including generous amounts of Munich, Pilsner, Caramel and Victory malts, Hallertau hops, yeast and water. As with all beers in the Hudepohl line, there are no fillers or adjuncts added to the beer. Adorned with imagery from the flag of Bavaria and the city of Munich, the blue, white and orange packaging pays homage to the Oktoberfest originations of the Munich festival. This brew has an ABV of 5.4% and comes in a 12 oz. bottle. The Hudepohl Oktoberfest Bier poured a clear, dark amber color with some abundant orange highlights showing through around the bottom of the glass. The head was somewhat creamy and off white in color. The crown was comprised of both large and small, tight, compact, creamy bubbles. It was excellently sized with decent retention and the lacing looked pretty good. Not a bad looking beer here. The aroma brought forth a hearty waft of caramel sweetness along with some toasted malts and scant earthy hops. I even started to recognize a slight nuttiness as well as a whipped butter note. This brew seemed more robust and malty than the typical Oktoberfest styled beers… and I liked it. The taste disclosed more of the toasted malts as well as a secure caramel sweetness. Further hints of grain and wheat bread were attained with an earthiness that beget a very round and smooth flavor profile. Just a minute touch of bitterness and spice were found, although I did stumble upon another redolence of nuttiness. The overall taste was nicely balanced, even and durable. I think this is a solid beer right here. It was a surprise for sure because I had no idea what to expect. The only other brews I’ve had from this brewery were the Schoenling Little King and the Hudepohl Amber and, to tell the truth, I didn’t think too much of those. This beer, however, had a very nice appearance, smell and taste. I definitely think it’s worth a try if you are looking for a different brewery’s Oktoberfest beer to escape from the traditional staples this Fall. I don’t think that I would have any trouble trying this brew again. Feel free to add a comment to the post if you have tried the Hudepohl Oktoberfest Bier. I would love to hear what you thought of it. Thanks for reading guys. Until next time. For the review tonight, I thought I would do a fun little beer that has garnered somewhat of a minor cult status among beer drinkers. 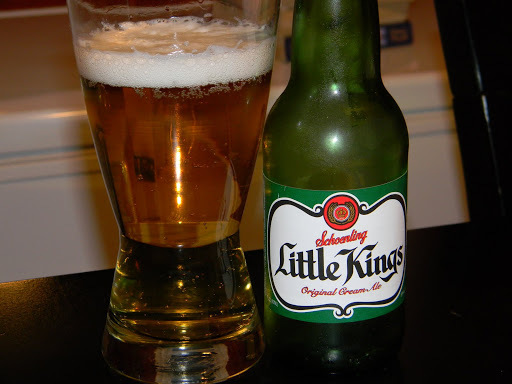 It’s the Shoenling Little Kings Original Cream Ale brewed by the Hudephol-Schoenling Brewing Company in Cincinnati, Ohio. What is a Cream Ale? It’s beer. Very, very special and delicious beer. It’s also a truly American style of beer similar to a clean American lager, but with the body and head of an ale. Hmm…. Not much to go on there. I guess all that’s left to do is just see for ourselves. This brew comes in a small, quaint, little, 7 oz. green bottle and weighs in at 5.5% ABV. With a very aggressive pour, this straw yellow, very clear beer produced a bright white, fizzy, soapy head with decent size. It didn’t maintain its retention very well, however it did generate a scant amount of lacing. The head settled to a thin film on top and as I looked at it a bit closer I could see several bubbles rising to the top of the glass. The smell was a grassy, grainy, corn type of smell. Very similar to a “macro”, but a slight bit sweeter than most of the Miller/Bud/Coors beers. The flavor brought out more of the corn adjuncts with bits of grain and rice. No real bitterness to speak of and overall it was a bit tame and inconsiderable. The mouthfeel was very light, although it was genuinely crisp and smooth. It had a watery texture that could be quite refreshing because it went down very easy. Not much flavor was left on the palate. You simply need to drink and swallow. This beer would be a nice thirst quencher during a hot Summers day. A beer for tailgating or hanging out around the BBQ during a cookout. There is not much to it. Simple, straight forward and uninspired. It’s slightly better than the “Big 3”, but I wouldn’t go out of my way to pick this up. A person could pound several of these and not think twice about it. It doesn’t have much in the way of aroma, taste or mouthfeel. Basically, you need to just turn it up, drink it and not try to analyze it.